The U.S. Department of State's Bureau of Educational and Cultural Affairs Fulbright Program has awarded grants to and Cailey Stevens ’12, Sophia Mo ’14, Jennifer Lu ’12, and Christine Keung ’14. Preparing to travel to Mexico, France, China, and Germany, respectively, each alum will engage with local communities through a variety of activities, including research, teaching English, and civic engagement. In addition to two other Wellesley alums who received 2014 Fulbright awards but elected to accept other opportunities, these women join a long tradition of Wellesley Fulbright Scholars. According to the Fulbright website, the program is "the flagship international educational exchange program sponsored by the U.S. government and is designed to increase mutual understanding between the people of the United States and the people of other countries.” The program was established in 1946. 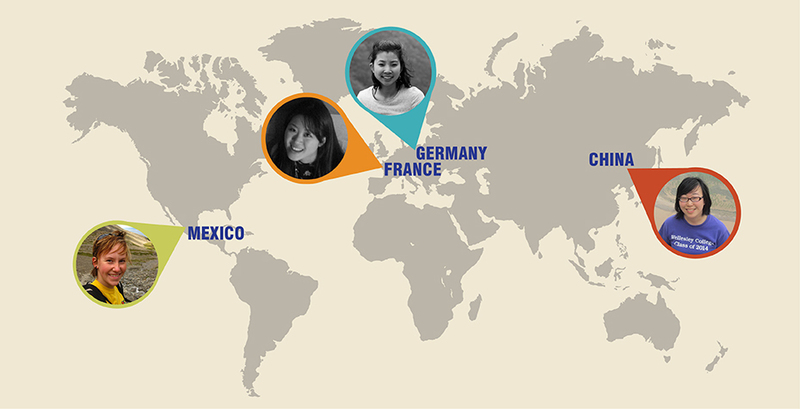 Meet this year's Wellesley Fulbright winners. The first year after she graduated, Jenny Lu ’12 won a Susan Rappaport Knafel ‘52 Scholarship for Foreign Study to research British Sign Language and child development at University College London. The next year, she won a CouchSurfing “Get Inspired” contest to travel the world and visit different Deaf communities in order to learn different sign languages. Now, through her Fulbright English Teaching Assistantship, Lu will spend a year teaching in Germany and learning more about the German Deaf community. With her Fulbright grant, Keung will return to Xi’an and explore rural communities on the Loess Plateau. She will examine issues of rural immigration and waste infrastructure, as varying degrees of industrialization and urbanization affect these villages in different ways. The interdisciplinary nature of her project is inspired by her Wellesley studies. Keung gives credit to many of the professors who helped her along her journey, including Eni Mustafaraj, Mingwei Song, Pinar Keskin, and Jay Turner. As a Fulbright English Teaching Assistant, Mo will teach English at a local high school. She also plans to lead an extracurricular “oratory arts” club, to involve her students in speech, debate, and drama. In addition to her experience double-majoring in French and international relations, Mo draws from years of involvement in mock trial and debate clubs herself, as well as time spent working as public speaking tutor in the Wellesley Pforzheimer Learning and Tutoring Center.